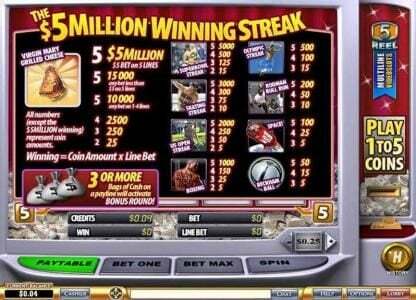 $5 Million Winning Streak is a 5 game reel slot machine with a maximum payout of $5,000,000 using the sport theme. $5 Million Winning Streak Slots has not been reviewed yet, be the first to rate this slot. $5 Million Winning Streak is a 5 reel, 5 line video Slot powered by Playtech offering a whooping top jackpot of $5 million dollars. Not only does this attract all types of players but since it offer a few paylines, the slot game offers more than 25 payout combinations giving players are guarantee to win a payout on every spin. The slot game offers great gaming action to include gaming features such as the wild and the Bonus round that allows you to win various bonus prizes. This slot game is based on a sport theme and you will get to see a variety of sporting games during game play. $5 Million Winning Streak is more similar to the classic reel slots but the only difference is that it offers the wild and the bonus feature game. During game play, it showcases a variety of icons to include the space ship, beckham ball, skating streak, Olympic streak, US open streak, boxing, and many others. Other gaming features offers include the autoplay feature and players are able to adjust the speed of the game as well as adjusting the sound. $5 Million Winning Streak offers a coin denomination of $0.25 - $5 and allows wagers to place a max of a single coin per payline. This slot game offers a maximum bet of $5 per spin which attracts low to medium wagers but due to the top award offered, high rollers find the slot game attractive. It is a multi-denomination video slot offers a variety of payout combinations and it offers multi-currencies. In order to trigger the top award, players would have to wager on max bet. The Virgin Mary grilled cheese is the main icon that triggers the top award of 1 million coins when 5 Virgin Mary grilled cheese icons appear on a payline of $5 max bet. If played on less max bet, players will hit a second top jackpot of 15,000 coins when the Virgin Mary grilled cheese appears on a payline of max 4 coin bet. 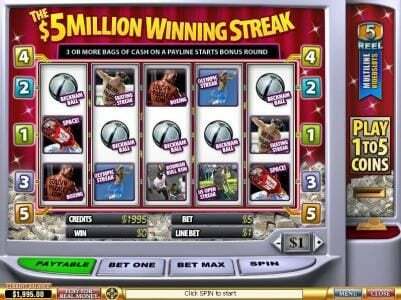 Another added advantage of playing $5 Million Winning Streak is that it offers the $5 Million Winning Streak bonus feature game that is activated when 3 bag of money icons appear on a payline across the reels. You will get to receive bonus cash prizes. By playing $5 Million Winning Streak Slots from Playtech, a player is able to trigger 1 million coins with just a $5 bet.